This evening, while we were sitting at our computers, we heard skittering and thundering of little paws, and the distinctive cry of a cat who has caught some prey and is very, very proud of it. I figured it was just Sherman doing his usual ‘time to burn off the crazy’ dash around the house, but when Richard went into the kitchen later, he started laughing. Turns out the ‘prey’ Sherman had caught was a ball of yarn – a light fluffy mohair blend that apparently was extremely appealing to cats – and he was having SO much fun with it, throwing it into the air, batting it into a paper bag and then pouncing on it, smacking it across the floor. I took the yarn away, and tucked it into my knitting bag while Sherman was otherwise distracted in a different room. Alas, that wasn’t enough to hide it because roughly ten minutes later, oh hey, is that skittering and sliding of paper and ‘I caught something I’m not supposed to have!’ vocalizations we hear again? This time I hid the yarn better, so he couldn’t get to it. I was so tempted to let him keep it, because he was so happy playing with it, but I really have no desire to repeat the ‘extra tail’ experience of 2014, so he’ll just have to make do with the packing paper that’s still lying on the floor, and the collection of empty boxes, and the bazillion other, safer cat toys scattered all around the house. 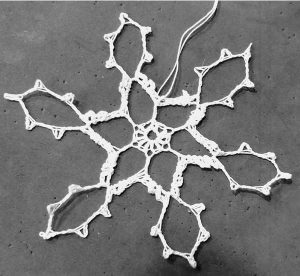 I could swear I have made a snowflake very similar to this one, but who knows. At this point they’re all starting to swim together.